The MJS and Prime Lift East Coast Mini Stock Tour comes off a StickerFool.com 50 which not only saw a fifth different winner in as many races this year but also a first time winner. Cody Byrne (Orwell Cove, PE) and the LDR Racing crew was emotional at Petty International Raceway as they celebrated their maiden voyage to victory lane on the MJS and Prime Lift East Coast Mini Stock Tour. Byrne had to hold off a hard charging Chris Hatcher (Beaver Bank, NS), Andrew Warren (White’s Lake, NS) and Tim Webster (Beaver Bank, NS) for the win, making the win even more satisfying. Looking forward, those four drivers via their top four finishes at Petty International Raceway have qualified for the United Rentals Dash for Cash finale. The top finishing driver amongst the four in the Pub’s Drive Thru Bottle Exchange 50 at Speedway 660 will receive a $100 cash bonus. Hatcher, driving the No. 31 Multi-Tech Automotive Civic for Matthew Warren, won the United Rentals Dash for Cash bonus at Petty International Raceway in the StickerFool.com 50 while Jesse Deveau (Greenwood, NS) took the inaugural bonus home at the Bruce Honda Showdown on the Shore at Lake Doucette Motor Speedway. Hatcher will return to the seat of the No. 31 car this weekend and will have a ten point lead in the standings over Andrew Warren and a 15-point advantage over 2017 Tour champion Webster. Dave Matthews (Kennetcook, NS) has slid to 28 points behind the leaders in fourth while Darren Flemming (Belnan, NS) continues to hold down fifth with Byrne closing in with a move to sixth in the standings following his victory. With five different winners this season in as many races (Matthew Warren, Andrew Warren, Matthews, Webster, Byrne), the drivers within the Pub’s Drive Thru Bottle Exchange 50 will either be looking to be the one to extend the streak or, in the case of the previous winners, will look to become the first two-time winner on the season. Flemming came within two laps of winning this event one year ago before Matthews slipped by with a thrilling outside pass that had fans on the edge of their seats coming to the white flag. Deveau, who won the TJ Greenlawn Dirt Clash in 2017 and finished on the podium at the Bruce Honda Showdown on the Shore, is looking for their first Tour win this year and could steal the SpeedWeekend show if the cards fall his way. It is a home track of sorts for Neil Miousse (Kentville, NS). Miousse raced in the Fredericton Gun Shop Sharp Shooters division at Speedway 660 before relocating to the Annapolis Valley. Miousse, driving for Bob Landry, will enter Saturday’s Pubs Drive Thru Bottle Exchange 50 as not only a favorite to extend the winner’s list but as a “hometown favorite” of sorts amongst those in the stands and in the pits. Chris Garnett (Havelock, NB) is the only New Brunswick based car on the pre-entry list for Saturday. Garnett rebounded from a motor issue at Riverside during the Passione Flooring and Interiors 50 to find speed in his car enough to take the Giles Auto World Pole Challenge at Petty International Raceway. While he did not get the finish indicative of his speed throughout practice and qualifying, he will look to roll the momentum he is building to Speedway 660 for the Pub’s Drive Thru Bottle Exchange 50. “The Ironman” Drew MacEachern (Dartmouth, NS) and Taylor McLean (New Glasgow, NS) have both shown speed in recent rounds but have aspirations of cracking the podium in one of the final two races of the MJS and Prime Lift East Coast Mini Stock Tour season. Jerome Tracey (Port Hawksbury, NS) will make the long haul from Cape Breton with hopes of giving the younger generation on the Tour a run as a part of New Brunswick’s biggest motorsports event of the season. Drivers will be racing for numerous contingency awards during the Pub’s Drive Thru Bottle Exchange 50. These awards include the United Rentals Dash for Cash, Giles Auto World Pole Challenge, the EIT Race Radios Hard Charger Award and the Rock Auto/Team 29 Hard Luck Award. Fans that cannot make it to Speedway 660 on Saturday evening can watch every lap live from the track online through Pit Row TV. The premium video broadcast will feature multiple camera angles of the action, live scoring, replays and a feed from the track’s public address system. Fans can tune in to all the racing action this weekend at PitRow.tv. It is a full card of racing to kick off SpeedWeekend 2018 on Saturday evening. 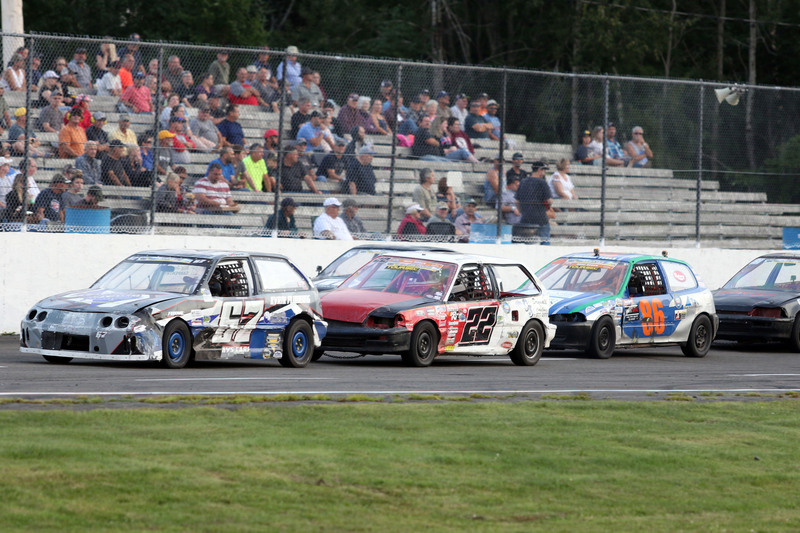 In addition to the Martin’s Home Heating Sportsman 150, action will include the Tim’s Corner Motorsports Bandolero Blast INEX National Qualifier, the MJS and Prime Lift East Coast Mini Stock Tour Pub’s Drive Thru Bottle Exchange 50 and the Maritime League of Legends King Freight Line 50 INEX National Qualifier. Post time is 6pm on Saturday. The McLaughlin Roof Trusses Pro Stock 250 will anchor Sunday’s racing as a part of SpeedWeekend 2018 and will have support on Sunday afternoon from the Atlantic Modified Tour, DMR Auto Street Stocks, Fredericton Gun Shop Sharp Shooters and Tim’s Corner Motorsports Bandolero Blast finale. Qualifying on Sunday in all divisions begins at 2pm with Opening Ceremonies for the McLaughlin Roof Trusses 250 slated for 6:30pm on Sunday evening. Fans are reminded that SpeedWeekend 2018 tickets and campsites are now available. An order form for both can be found on the front page of Speedway660.com or on the SpeedWeekend page on the website. Those that would like to order in person can order at the Speedway 660 office. 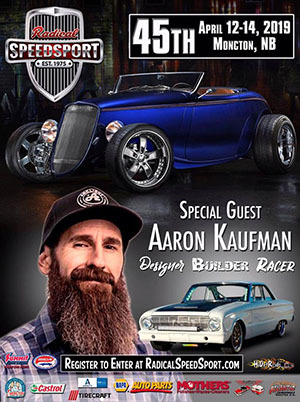 For more information about Speedway 660, visit Speedway660.com, like @Speedway660 on Facebook or call the Speedway 660 Raceline at (506) 454-7223.